← Naked Times Square, cont. That’s the question asked by Rachel Slade in Boston magazine. Her answer is that developers don’t hire enough Thom Maynes or Renzo Pianos. The real answer is that developers hire too many Thom Mayne and Renzo Piano wannabes, and that the wannabes produce the exact same junk as their gods. And Renzo Piano was here. But I doubt that Slade is as disappointed as I am with the results at the Isabella Stewart Gardner Museum. Slade expresses regret that the great and elusive Piano was run out of Boston by the Federal Aviation Administration, which for safety reasons in the vicinity of Logan cut his proposed tower’s height from 1,000 to 700 feet, causing Piano to bolt in a huff. But he was invited to Boston, which deflates her theory that blame for its “ugliness” can be laid to the stultified planning culture of Boston. 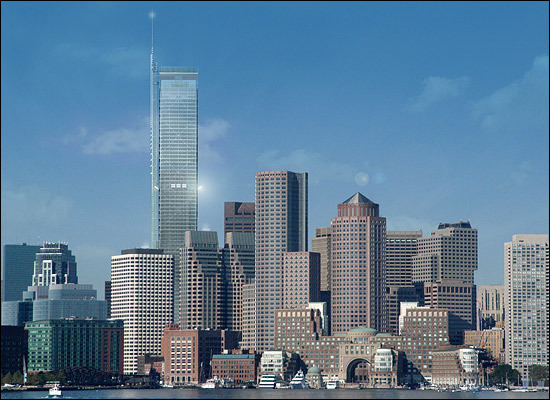 That culture is stultified, but not because it refuses to encourage Boston developers to hire wackier architects. In the process of wondering why Boston planners allowed developers to clog the Seaport District’s waterfront with commercial rather than residential architecture, Slade mentions Paris. The City of Light once restricted tall buildings to La Défense, beyond the city center. “Yes, it’s miserable,” writes Slade, “but it’s not blocking anyone’s views of Notre Dame.” No it’s not. But if La Défense is miserable – and it certainly is – does Slade expect that it would look any better plopped in the middle of Boston? So: “Why is Boston so ugly?” Well, actually it’s not. But if it were, the reason would be that it has too much modern architecture, not too little. Modern architects and their academic camp followers pride themselves on their disdain for beauty. Modern architects do not seek accolades for beauty, so they cannot be accused of worrying much about ugliness. This is perfectly evident in the city districts around the world for which they are responsible. As mainstream architecture critic Paul Goldberger (Vanity Fair, The New Yorker, New York Times) has had the honesty to admit in print on occasion, modernism has produced great buildings but never a great city. Even Rem Koolhaas has produced a poster that mocks the idea of a skyline composed of the world’s most iconic modernist towers. So, no, Boston is not “so ugly.” Quite the reverse. It is beautiful for an American city, and for one reason: It has less modern architecture than most American cities, many historic towers of great beauty, and, most of all, it has vast stretches of historic architecture that most American cities do not have. 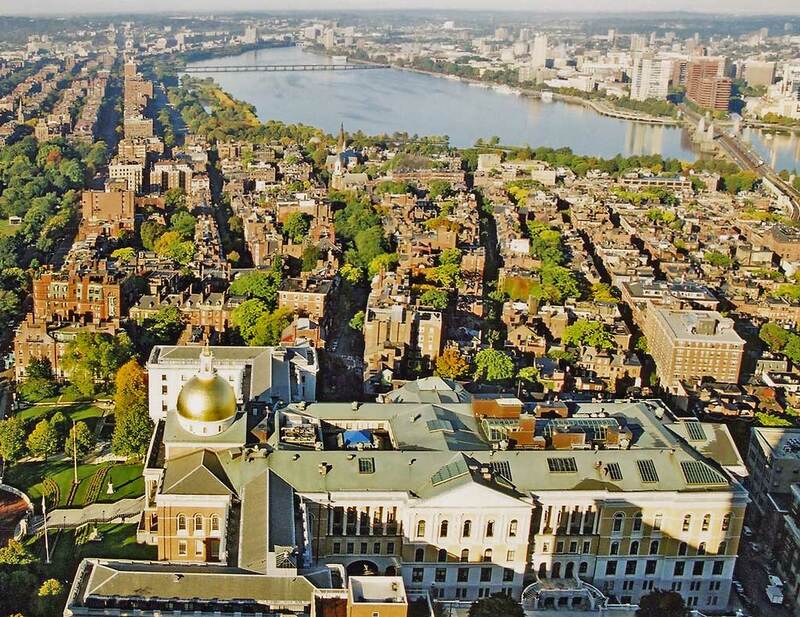 Boston has places such as Beacon Hill and the Back Bay, where modern architecture is almost nonexistent. These are the places where property values are the highest, and where visitors to Boston head almost to the exclusion of every other district, except maybe for the South End, the North End and Jamaica Plain, where modern architecture also very rarely raises its ugly head, or Fenway, if they are Sox fans. At the Boston Redevelopment Authority, the Boston Civic Design Commission (with its “rock ‘n’ roll acronym”) and the Boston Society of Architects, new traditional architecture is the architecture that dare not speak its name. It has been locked in the closet since World War II. It is no surprise that Slade does not mention it. An architect and now the “articles editor” of the magazine’s Home section, she is a fountain of orthodoxy. She betrays only one single hint that there might be an alternative to the modernism that she fails to perceive is the problem, the answer to which, especially in Boston, is as plain as the nose on her face. The closest she comes to mentioning this alternative to modernism is a snide reference to the work of The Architectural Team, a “miserable” firm based in Cambridge and “known for the most stomach-churning kind of suburban ‘town-like’ architecture.” One may safely assume she refers to the firm’s more traditional projects rather than its modernist work. Naturally, she prefers her modernism to be performed by firms that would not deign to have any new traditional work in their portfolios. Rachel Slade seems unaware that the ugliness she perceives is in fact what she wants to see more of in Boston. The difference between “good” modern architecture and “bad” modern architecture about which she endlessly hyperventilates simply does not exist, not even on its own terms – not to mention the difference between “beautiful” modern architecture and “ugly” modern architecture. She uses the word ugly again and again without once suggesting that its opposite should be a goal of planning and design policy in Boston. But I think she understands the nature of her confusion, and the reality she continues to deny; she just ain’t sayin’ – it would raise too many predictable and yet, for her, entirely unanswerable questions. This entry was posted in Architects, Architecture, Art and design, Development, Urbanism and planning and tagged Boston, Boston Home, Boston Magazine, Planning, Rachel Slade. Bookmark the permalink.